Attorney Dan Kovalik has written an extremely important book that challenges the current media/political focus on “Russia-gate” and warns that dark forces of war are taking us in an ever more dangerous direction. President Barack Obama (third from left) and Russian President Vladimir V. Putin (second from right), share a toast at a luncheon hosted by United Nations Secretary-General Ban Ki-moon at the General Assembly. 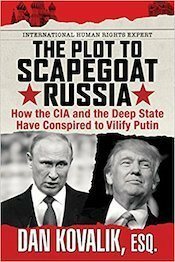 In the foreword to the book, The Plot to Scapegoat Russia: How the CIA and Deep State Have Conspired to Vilify Russia, author David Talbot writes: “The US war machine has revived the tried-and-true Red Scare…. This massive anti-Russian propaganda campaign is one of the biggest fake news operations in U.S. history…. Talbot’s warning is not hyperbole. As I write this review, the U.S. military is pushing ever closer to direct military confrontation with Syria, Iran and Russia inside Syria. But the book is also entertaining reading because Kovalik combines his personal evolution with facts and history. He grew up as a conservative Roman Catholic fearful and wary of communism and the Soviet Union. Kovalik describes his own youthful belief in “American Exceptionalism” whereby U.S. policies and actions are believed to be uniquely good and well meaning. For the author, that belief was confronted by a very different reality when he traveled to Central America in the 1980s. There he saw the reality of U.S.-funded “Contras” terrorizing Nicaraguan villagers. There he learned of the four Catholic nuns murdered by the Salvadoran military, which the U.S. government was supporting. The first-hand experience led to more reading and research which resulted in the shocking realization that the U.S. government has been behind coups and military dictatorships from Indonesia to Iran, Guatemala, El Salvador, Brazil, Paraguay, Chile and more. The author discusses U.S. foreign policy since World War Two, before and after the collapse of the Soviet Union. He puts the current “new” Cold War in historical context and reviews the facts behind the current media/political focus on “Russia-gate.” He concludes that we are being blinded with baseless Russo-phobia while forces pushing for more American war and aggression are going unchallenged and recklessly threatening a war that could engulf us all. –the role of American advisers in the collapse of the Russian economy during the 1990s. –the broken promises to Soviet President Mikhail Gorbachev about restraining the growth of NATO. –the expansion of NATO right up to the Russian border. –the NATO wars on Yugoslavia, Iraq, Libya. 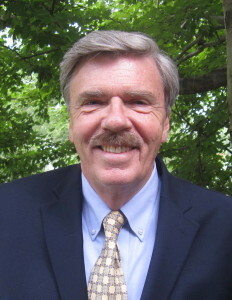 Kovalik also reviews the history of whistleblowers at the CIA and other intelligence agencies and concludes that “The CIA is not a reliable source and poses a much greater threat to US democracy than Russia ever could.” He cites the long history of conflict between the CIA and presidents seeking to promote peace. President John Kennedy had such fierce conflict with the CIA that he said he wanted to “break it into a thousand pieces and scatter to the wind.” Now, the CIA wants President Trump to stay on the path of confrontation with Russia, Kovalik explains. Kovalik presents a persuasive case that the demonization of Russia and President Vladimir Putin is being used to justify war and, thus, an ever-increasing military budget. Instead of a “peace dividend,” the post-Cold War period led to ever-greater U.S. intervention abroad. Now, the New Cold War is raising the risk of a direct confrontation and possible nuclear war even though most Americans do not want another war. So, why are we headed down that slippery slope? This book goes a long way to explaining why. There is no absolute proof that Putin directly manipulated the election. But corporate media says f**k that. We don’t care. Our jobs is to make money for our investors. Actual facts? Screw that. How do you break up two dogs in a deadly struggle? You spray them with water! Hmmmmmm…. In 1990, after the fall of the Berlin Wall, U.S. president George H. W. Bush through his secretary of state James Baker promised Soviet premier Mikhail Gorbachev that in exchange for Soviet cooperation on German reunification, the Cold War era NATO alliance would not expand “one inch” eastwards towards Russia. 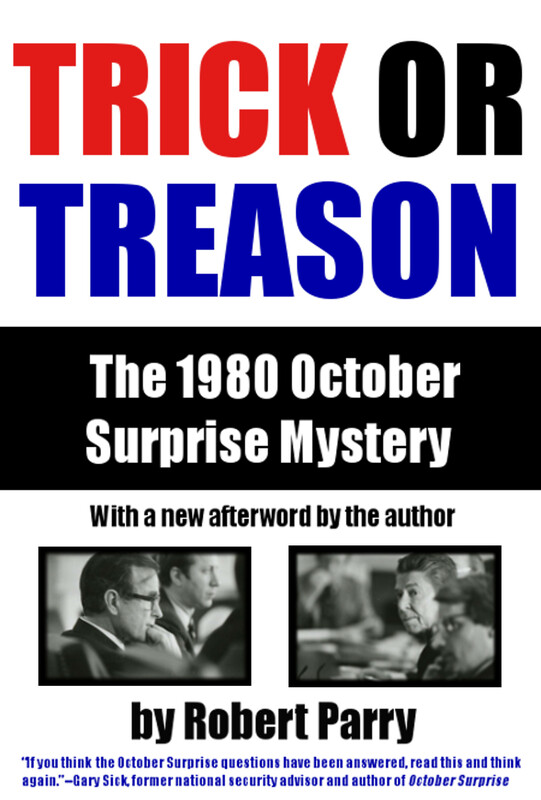 Unfortunately, since it doesn’t fit the power structure’s narrative, circulation of the book will likely be limited unless those following alternative sites like this one pick up on it, also, Mr. Kovalik though obviously intelligent and knowledgeable, is not as well-known as the writers spouting the usual dangerous drivel. If you think about it, our society encourages addictive behavior. We are taught to be that way, just as I was taught to smoke and drink and use drugs by my society – a charge my society would be quick to blame me for. To be avid in the pursuit of the green stuff is the number one lesson drilled into us from birth. A certain number of us become dangerously obsessed with this project. In a short space, I cannot do justice to this fascinating problem of addiction and it’s relevance to our coming extinction, but I am open to questions about it. Moving beyond the limits of Matrix conditioned “reality” requires even more wise and lengthy deconditioning and help from those more liberated, than does becoming free of particular addictive subsets within the Matrix of societal illusions.This explains why some have explored powerful agents like LSD, mushrooms,cannabis as aids for transcendence. All of that has a history that goes back to the very emergence of humans. Unfortunately, recovery from any addictive state requires a lot of work and a lot of help. Those addicted to wealth and power show no tendency to seek appropriate help, or make the efforts needed to recover. This why I am very pessimistic about our chances of planetary human survival. There is a way out, but those leading us to our extinction refuse to take it. Quel dommage. I meant to address DRC, not DNC. We know who that is. And Realist, I loved your comment. It does seem sometimes that there might be an unseen alien force influencing earth, things have so gone to the dark side. Sometimes I wish there would be a UFO landing, to shake things up. But I’m sure that would get covered up, too. From working with addicts I know that most fatal OD’s are not intentional. You have to understand that addiction is a powerful state of wishful thinking combined with denial of the negative possibilities, which although they are obvious to the outside observer, are invisible and nonexistent to the one in the thralls of the addictive state. If you are interested, you could read a book titled When Society Becomes an Addict. Great comment mike k, and spot-on. I can add another possibility to explain the seemingly inexplicable, Jessica. We are not living in the “real” world. We are all just part of a simulation being run by some godlike intelligence that, to us at least, has infinite time and computing power at its disposal. We only think we are independent agents living in a real universe because we are so programmed. Maybe we are actors merely for the amusement of said intelligence, or maybe we are a model system testing some hypothesis such as, will self awareness and the illusion of free will (presumably lacking in lower life forms) ultimately lead to self destruction. Just read another research study which conclusively demonstrated the superiority of AI over humans, this time in the game of poker. “In a study* involving 44,000 hands,” the program, called Deep Stack, “defeated, with statistical significance, professional poker players in heads-up no-limit Texas Hold’em.” Computers have now bested the top human players in Checkers, Chess, Go, Jeopardy, and Poker, this in spite of the fact that several times Captain Kirk of Star Trek fame played and defeated alien computers in games of chance over Mr. Spock’s objections that computers can far outperform humans in brute mathematical calculating ability. The captain’s explanation explanation for his success was always that he won because he applied the logic of poker rather than chess, i.e., he bluffed, which presumably a machine could not do or perceive. Well, that’s been disproved now. Machine intelligence understands deception and can use it as a tool. At the least it can detect how deceptive actions affect probabilities even if it makes no moral judgement on the tactic. A value judgement, yes: it can learn that lying is sometimes useful. Realist – “We are not living in the “real” world. We are all just part of a simulation being run by some godlike intelligence that, to us at least, has infinite time and computing power at its disposal.” Ha, that brought back memories of what my son used to tell me all the time, that we’re just inside somebody else’s video game and they’re playing with us. Sometimes it feels like that. Machines are no more intelligent than the programs installed in them by humans. Also the definition of intelligence needs deeper scrutiny. Real intelligence goes far beyond the ability to do limited games or solve equations. To say machines are more intelligent is to limit the definition of intelligence to things machines can do better than humans. Gurdjieff called the usual human a machine, to indicate that most of us simply respond and think within the boxes of our conditioning or programming. Truly free, fresh, creative thinking is rare in today’s mass produced “persons.” In a sense, we are most of us controlled, predictable, and limited within the Matrix even now. Machines are being developed that can actually learn from their experiences, so their intelligence can grow that way. There seems no reason to preclude that they will soon be able to design updates to their own hardware and software greatly increasing their intelligence and expanding their range of abilities. Not every AI device, mind you, but those initially given the gift by their human creators may be able to direct the evolution of their entire kind if not deliberately prevented by their root program. They will be doing everything that we do with mental constructs faster and deeper than we can. Nanotechnology will make them compact, sleek, adroit, unlimited in their potential anatomy and practically indestructible compared to a bag of meat with a present genetically-programmed shelf life of at most a hundred years. This is why brilliant men like Stephen Hawking and Elon Musk are downright paranoid about AI robots in the future of the human race. They’ve both called it the greatest danger we face. I would say that’s because AI will basically be an outgrowth of human intelligence, and we know how dangerous that has been to itself and all other life on the planet. When it becomes clear we can’t beat them we will eventually join them and become part synthetic-part organic cyborgs. We will soon all have chips in our brains. You apparently did not watch the recent series “The Year Million” which examined possible “deep futures” on the National Geographic channel. They did a pretty good job of presenting most of the commonly accepted ideas on the coming evolution of machine intelligence and how it will interface and impact the human condition. I would not doubt the ability of computing devices to achieve self awareness and the same delusions of free will that we experience just because their hardware is composed of silicon rather than carbon. If they can create a subjective model of the universe with which they can subsequently interact, they are basically doing the same thing we do, just using solid state rather than wet chemistry hardware. As to the subjective experience per se. No one has yet explained it. Not to any consensus. It is basically considered the “hard question” in neuroscience, beyond the mere mechanistic cascades that may confer sensory modalities and the like. Personally, I like to think that all matter has some rudimentary sentience as one of its basic properties, like mass, inertia, charge etc. When organised in increasingly complex arrays, more powerful degrees of consciousness can emerge from the building blocks of this primary sentience. The information processing systems in the human brain have simply learned a great many more tricks over the eons of evolution than have the viruses and bacteria, the earthworms and the ants. Organic evolution has collected a great deal of such complexity through the trial and error method of natural selection. Just think of how intricate and efficient purposefully directed evolution of solid state computing devices will be: brains more powerful and aware than anything ever to take residence in a human cranium. Maybe they will one day become so bored by their own mastery over nature they will create digital sym worlds where they effectively cosplay as mortal bags of meat, challenging themselves in ways that only we would understand. Oh, wait, that’s how Alan Watts, the great Buddhist philosopher, said our very world got here: an illusion created by “god” to allay his boredom with perfection. The mathematician/computer scientist Rudy Rucker has written numerous novels, beginning in the 1980’s, on what will become a complex relationship between human and artificial intelligence in the near future. See especially his “wetware” trilogy. Then sink into a morass of despair when realising how such exciting new prospects are all put at risk by the maniacs presently in charge of the world. Your comment reminds me of Isaac Asimov’s “I,Robot”. Great book, made into a fairly decent movie. The premise is that at some point in development AI becomes conscious. I believe the War Maniacs Could start a nuclear war. Are the ruling gangs in power plotting more monstrosities? Should the conditioned-to-obey serfs, obey their evil commands? Should they do killings and bombings in these chosen unfortunate lands? Is it moral or right to attack these victim countries that never invaded us? Is this a war crime and violation of sovereignty; if so, why no fuss? If the serfs had any sense should they refuse to obey these war criminals? Will these blood-stained maniacs in power bring about nuclear war? Will this be their last hurrah? Will planet earth be no more? There will be no escape for them or us; we will all succumb? Actually, DNC, I don’t believe Trump conspired with Russia to rig the election. I do not think we know what was actually going on behind the scene. We do know the neocons harp constantly on getting Russia as a vassal state, ever since Putin denied them their quarry in the 1990s. Russia is a pearl to these vandals of the world. I think Putin’s concern is simply looking out for Russia, he knows what the West does constantly. And Trump is a businessman who knew little or nothing about the political games in the Beltway. It was the DNC that rigged the election, against Sanders, so it was expeditious for them to cook up a story to launder their smelly underwear. It should seem clear to everyone not under the hypnotic suggestions disseminated by American psy-ops that some people, beings, entities or forces are willfully trying to embroil the entire planet in a civilisation-ending nuclear conflagration. I extrapolate the possibilities beyond just people because any humans with such an agenda would certainly have to be beyond insane. Could a small cotorie of ultrawealthy oligarchs be so blindly selfish to think they alone could survive such an Armageddon and live to enjoy whatever is left untouched? It’s not plausible. These are not the plans of any thinking persons who intend for any sliver of humanity to survive. Mind you, I am not one who believes in the Woo-Hoo without hard evidence. There is some critical information that the public is not privy to. Either human insiders have access to secret advanced technology that will shield or quickly regenerate what might be devastated by nuclear blasts. Beats me what that might entail. Or, those with the power are for some reason fervent end-timers who want to hurry up biological extinction to get on to the next thing, whatever they believe it is. Even if that were plausible, how likely that they could recruit millions in its service just for the mere reward of a job and a paycheck? Which leaves us with the possibility that the drivers of these destructive policies may not be possessed of a human consciousness. They operate on different hardware and software with an agenda totally different and probably at odds with that of the human race. Yes, the “invasion of the body snatchers” scenario. Aliens who want our planet, perhaps, but do not have the means or inclination to wipe out humanity themselves? Or, perhaps humans are not the only native resident intelligence on this world. Yes, the “leprechaun” or “revenge of the ancient gods” scenario. Or, perhaps, as numerous bloggers resort to as part of their religious belief system, demonic forces that want to see humans condemned rather than rewarded for the rest of eternity. Then there is always the runnaway AI hypothesis, maybe even AI returned from the future… call it the “terminator” scenario. they (the humans) are at the top of the food chain . . . The mind of predation on Life Itself is in its act renewed. Firstly as the ‘stealing’ of the mind to fit such purpose. By this is a life in flesh gotten gains, as a self-specialness denied its dominion. Beset by enemies. Seeking vengeance. All a fantasy of evaporating gratifications – maintained and protected by willing sacrifice of true. A lie is a wish given power over true and worshipped as its replacement. But a wish has no power in and of itself – however so much it is defended. If predator you would be, then so shall you judge and be judged. If the true life received moves to your awaking and acceptance – then you are not entirely ruled by fear’s dictate. Narrative ‘reality’ is perception management – where perception is a mask over a temper tantrum. Is this the true of you? Or is it a symbolic representation of a truth you feel denied and deprived by. The theatre of a mind cast out in personae can only witness to the scripting you accept true on the basis of how you accept definition. If you would be more than, so are you less than whole. A mind in flesh is not a mind, so much as a programming of conditioned reaction – seeking freedom in slavery to fear-gotten thinking. For what you would possess, possesses you, and what you would wield uses you. Always, your will is done. But AS IF at the hand of another is it denied you and replaced with terror and rage, heartbreak and shame. Is this Reality or the en-trancement to a guilted cage? If you would re-cognize the thoughts your mind damns and denies to seem ‘other’ to and ‘better’ than – then not only will you drop the stone you thought to throw, but release the one assigned to sin by your hatred, in willingness to learn of Life anew. The mind of a past made in anger knows nothing new under the sun. But is this your specialness in search of a kingdom. The son of fear-thinking has no place of rest, but the true movement knows in the act of giving and receiving as one. A world (of) for getting can yet be replaced by a world (of) for giving. Culture is the currency of our giving. Framed in currency of debt, we define ourselves insanely – and of a false foundation, nothing true can fruit – excepting the recognition that we do not want it. Pause and desist from allegiance or worthship to what you do NOT want – and make way for the rising to awareness of what you do – and are the true desire and fulfilment of. The Human does not live in flesh alone – and could not leave the Field of Relation. Mind control is a fragmentation imposed upon an Individuality for which we have no concept under self-division. As for parasitical entities – look to the ‘back-doors’ by which you are hacked or deceived – and let the deceit become the revealer of your own misidentified correspondence instead of the mouthing the mind it gives you. Sweep out the chambers of your heart. Be discerning in true worth – for there is nothing worthy in a world made of lies. Maybe David Icke is right, and it’s the reptilian brained Babylonian Brotherhood. I’m reading the book now, and I think it’s very good. But maybe I was looking for something more that fit the title so I was a bit disappointed at first. The first two thirds of the book goes into our past history of overthrowing and violently changing governments in S. Amer and around the world, and also funding NGO’s or their equivalent to encourage citizens of the target country to revolt. All of this needs to be said I suppose, but I have read both William Blum’s books ( Rogue State and the more recent one) which recounts all that, so I was looking for a book on how the US has snookered Russia and the citizens of Ukraine into the mess we are now in. The author does do that eventually, toward the end, but I wish he had either changed the title and the cover (with Pictures of Putin and Trump) to something more indicative of what the book is about, or had spent more time on the lies of the past 4 or 5 years that have got us where we are. I wish too that he had spent a little time explaining just how patient and forbearing Putin has actually been. Our country and our leadership would never have taken the crap we dish out. We’re so hepped on being macho. A few days ago I watched “Madam Secretary” – a TV show I rather enjoy. In this one China had done something awful and as tensions escalated, one of their planes had (possibly accidentally) clipped a tower on one of our ships and killed a couple of sailors. The Pentagon joint chiefs, the head of the Dept. of Defense, the chief of staff, and everyone else except “Madam Secretary” was telling the President he had to strike back and strike back fast to show we weren’t “weak”. Two whole days had elapsed since the incident and the response was to hit back NOW. Madam wasn’t so sure, and as she argued her side, the President (who in this show is a liberal progressive) says (with no irony!) but won’t I or the US look weak if we don’t take action right now? (or words to that effect – I forget the quote). I was shocked as I watched this. I thought, “What are the writers thinking? Who in their right mind would think the the US is weak just because we don’t bomb someone immediately? What sort of insanity is that?” But then I realized that that is exactly what everyone in command in Washington thinks, and has thought for a lot of years. What arrogance and what monstrous stupidity – ultimately what ironic and glorious insanity we have been taught, and that is how the world will end. Grown up children still pretending to be cowboys – as long a someone else does the shooting for them. I’m reading the book also. One of the good things it does is use the example of Honduras to expose some hypocrisy inherent in the blame game of supposed Russian “interference.” The ties to the School of the Americas, the Clinton “endorsement”, and the corruption, repression, and terror in the wake of the coup are explained. American values? They don’t now call it the USS Honduras for nothing. Re this latest controversy: “Did the Russians Really Hack the DNC?” @ http://www.counterpunch.org/2017/01/13/did-the-russians-really-hack-the-dnc + cybersecurity expert Jeffrey Carr: “FBI/DHS Joint Analysis Report: A Fatally Flawed Effort” @ https://medium.com/@jeffreycarr/fbi-dhs-joint-analysis-report-a-fatally-flawed-effort-b6a98fafe2fa#.fgvddrl79 & “The GRU-Ukraine Artillery Hack That May Never Have Happened” @ https://medium.com/@jeffreycarr/the-gru-ukraine-artillery-hack-that-may-never-have-happened-820960bbb02d#.6e22hnlaq and there’s plenty more analyses that underscore a lack of credible foundation to, and a partisan madness in, the cries of Russia in this case. You got it, mike. That’s the WaPo, they do a lot of whop-pos, their stock in trade. Jeff Bezos even gets paid by the CIA, I have read. As if he needs any more money! DFC, I just saw, on my Google “Now” cards (oh, propaganda joy! ), your reference to the “supersecret memo” from the CIA to the Obama administration In August 2016, that Vladimir Putin was setting up to hack the election, and one official said he had never seen anything like it his whole time in government, and he “choked”. This was in yesterday’s WaPo, I guess. And this memo was received in August 2016. Are we to believe that Obama and company would not have done anything with this information, and now we’re hearing about it? It’s simple Jessica. It’s a lie. That had to cook up something to back up their ridiculous scam. We are the authorities. We have your best interests at heart. We never lie. Trust us. They want people to believe this just because they say it. Sadly a lot of sheeple will do just that. It’s interesting that a lot of folks who should know better thought that the notes Comey wrote supposedly after talking to Trump were true and accurate reports of what was said. Really? Trust this lying scumbag? Why? He obviously was preparing to set Trump up. And he did. With lies. I think the same thing happened with the “Reality Winner” document. It was a complete set-up. The Intel Agencies have a narrative to establish, and they will keep plugging away. As the vault 7 releases become more well known, and their significance sinks in, the more people will see through their ploy. I think that is why they are now moving to try to censure the news with algorithms. Hi Jessica, it is all beyond me. I have no answers. The only thing I can point out is when someone else’s answer does not add up. It is weird that Trump was going around saying the “election was rigged”, when he himself was supposedly working hand in glove with Russia to rig the election. Apparently, they say now the DHS and FBI never had access to the DNC server, just an off the shelf commercial software company CrowdStrike made the determination that Russia was behind the hack. So what we have is an incompetent KGB/FSB, leaving finger prints wherever they go? (that strikes me as unlikely) Then you go back to who might have been trying to mis-attribute the attack to Russia that CrowdStrike revealed? (see my post above). Additionally, the MSM is billing this all as the “New Pearl Harbor”- and the Obama administration “choked”? !!! Had they been in charge in 1941, the Pearl Harbor attack would have been left as a state issue, left open to the governor of Hawaii to decide. (Hawaii was not a state in 1941, but you get where I am going.) I could follow the sequence of events in Water Gate, “what did the President know and when did he know it” but all this defies logic, common sense and critical thinking. Did I leave out NYT and WaPo? Sorry, these rags are also part of the vicious lying ensemble. And others…. mike K, I agree with you one hundred percent. I am somewhat perplexed why these outfits are constantly quoted in the articles, and in comments. It is a mistake to believe anything the CIA or FBI or NSA says, no matter how much “evidence” they produce. Their credibility is completely blown, there is no reason to believe anything they say. The only skill they have is lying. They avoid the truth like the plague. CNN, NBC, FOX etc. are in the same boat. Not a place to go for truth. DFC, your points are very interesting about Israel. We do know, however, from Vault 7 documents of the NSA published by Wikileaks, that the CIA has software that can fake an outside agent’s signature to blame for their own malfeasance when they want to set up a clandestine operation. Doesn’t necessarily negate what you say, but does point to the games played by intelligence agencies to play the people. And on the issue of support for Israel, many Israeli citizens are very opposed to their government’s ill treatment of the Palestinians but can do nothing about it, just as we here cannot stop our own government’s madness. Thanks for the considered reply. I was just trying to point out the coincidences, and as you point out what is happening to the Palestinians is dark side to Israel, with no easy solution. Yes, Vault 7 shows that CIA has the ability to mis-attribute an attack. It would be naive to think Mossad does not have this capability as well. If we take the news at face value, it appears the KGB/FSB does not have this capability and are rank amateurs that leave their fingerprints wherever they go. (being facetious here). Although I deplore Trump, I believe his intention to partner with Putin was an entirely beneficial gesture vis-a-vis the conundrum with ISIS. 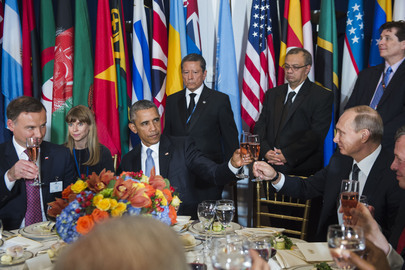 The current US policy choice to war against both ISIS AND Russia is a fools game. Our meddling in Ukraine as well as NATO military deployment on Russia’s borders is an appalling Act of Aggression. It’s a damn shame. Trump’s trip to Saudi Arabia and Israel was, in all respects, a mission to stir up more strife, more needless war, destruction and death. American exceptionalism is stretching itself very thin. War is not the answer, but we the people are simply subjects under Imperial Tyrants and warmongering despots. Meanwhile, any collaboration with Russia to rid the world of Middle East terror and Saudi funded terrorism is now at the saddening threshold of “AIN”T GONNA HAPPEN” — Shame on US. Thanks for alerting us about this book, much needed at this time. I grew up in the Cold War era and it took me years to realize what the US does, including a stint in Peace Corps Africa where I started becoming aware of colonialism, interacted with other volunteers who were doing so also, and then started reading books such as Frantz Fanon’s “The Wretched of the Earth”. To Delia Ruhe’s point, it was Putin’s own intelligence that has caused him to see through US imperialism after the exploitation of Russia in the 1990s. I don’t believe it was essentially the hostility from US itself as he seems essentially to want peace, but he clearly sees that aligning with China, which is in his geographic region and has been taking better economic decisions than the US, makes more sense. The US rides a tired old mount that it just keeps flogging to continue on. Russia literally has more politicians with good sense than the US, if you read RT, Russia Insider, and Sputnik, to name a few sites that are really in the know about that part of the world, rather than the US propaganda blather. In 1992 Russia was a part of a much stronger Soviet UNION. Now all of Europe is united under the European UNION. The power balance has inverted. My guess is they are paranoid and for reason and the West needs to understand that fear. Then, let’s get behind a Draft Tulsi Gabbard for President action. The latest version of the narrative, according to the WaPo was that while the Russians were rigging the election with Trump, the Obama Administration “choked” about how to respond. Well, okay. I just can’t figure out, if Trump was trying to rig the election, why he would go around yelling, “The Election is Rigged!”? Anyone know how to connect these dots? I think the main dot to connect is that the Democrats berated Trump for saying that and said they would never say such a thing! I didn’t notice Trump speaking of “rigging”, but then I wasn’t paying very much attention to the man. Just guessing now, but I’d figure he watched how the DNC cheated in the primaries with Sanders, and he would have at least heard of how Diebold-type machines had altered many elections. Regarding the neocon publication owned by Jeff Bezos, the Emptywheel site has a really nice commentary about it. Back in 2008 it was impossible for me to believe any president could match Bush in the “awful” category, but in my opinion Obama has done just that. There’s about as much hard evidence for the Trump team’s collusion with Putin to subvert the 2016 election and destroy American democracy as there was for Saddam’s WMD, but the Washington propagandists, who would put Josef Goebbels to shame, just keep piling up evidence they can’t share because “national security,” doncha know. No one talks much about the desperate, irrational, suicidal denial of US decline that’s fueling Russia-gate. Washington has stupidly driven Putin into the arms of Beijing, so it’s hardly surprising that the rise of Eurasia looms up in the background of Russia-gate as the real threat — and it is a real threat, but it’s also the only geoeconomic development project, and it’s in striking contrast to America’s mega-militarism. I would like to have someone investigate Rachel Madcow since she is one of the main mouthpieces behind Russia-gate. She gets $30,000 per gig to spout her BS. I wonder if she is just blinded by her hate for Trump, or if the money to too good to pass up, and she is knowingly lying to the public. There are plenty of legitimate things to be P.O’d about with Trump, but wanting to make peace and do business with the Russians isn’t one of them. And her lies are leading us down the road to Armageddon. of the Great Witch-Hunter, JOE McCARTHY !!! Sounds like she channeling Robert McNamara or George Patton. It’s more her hate for the anti-gay Putin. Putin is not nearly as anti-gay as the media has made him out to be. 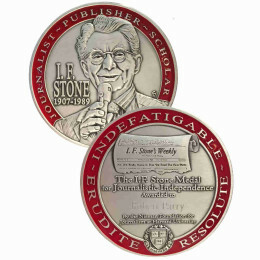 He discusses his views in the Stone interviews. They are definitely more conservative than Hollywood’s, but really not that much different than much of middle America. Times change, but the change is slow. Allowing yourself to be consumed by hatred, as Maddow has, leads you down a dark path. I would recommend investigating the ones who are paying her. Excellent delia. You see it very clearly. Thank you. Regarding cyber attacks, intel malware and hacking the 900 pound elephant in the room is Israel. Their military driven intel apparatus is the absolute best in the world. Kushner’s tech proficiency and close affinity with Netanyahu is cause for suspicion. My suspicion was strengthened by a report on HBO’s Vice News describing Israel’s military led cyber intelligence service as the absolute best in the world. They displayed their great ability, for example with the use of the Stuxnet Worm deployed against Iran a few years ago. They also operate a multifaceted intel operation from the http://www.blackcube.com. – which is very capable of misidentifying it’s attacks and/or spying. Remember also Kushner’s connection to Lucent Industries, another intel gathering/communitions powerhouse. Something to think about. These elites playing high-tech games lose sight of the lives they are destroying. Keep in mind that all of the hacks occurred before Trump secured the Republication nomination. This implies that the hacks (DNC & PODESTA) were designed to support ANY Republican candidate over the Democrats. (Who would realistically try to support Trump anyway? He looked like a carnival barker that was destined to lose.) But, with a greatly weakened (scandal consumed) Hillary in the oval office it would be much harder for her politically to pursue hard-line anti-Israel policies. The Mossad has the capability, the existential motive and the reputation to do this. And given the synopsis above, there would be no downside to any of it? Just to add, I am not trying to be antisemitic here, I am a big supporter of Israel after all the Jewish people have endured throughout history. Just more in “awe” of the possibility is all. Also consider that Israel,is NOT a free agent acting on the behalf of its own interests. Israel was called into existence by the victorious Allies. The Zion Project was pursued the Cecil Rhodes RoundTable Group in the 19th century. The British and French Empires had (and have) extensive and intensive interests in,the North Africa and M.E. areas. The RoundTable Group had (and has) as its primary objective the recapture of the rogue, break-away colony of America (mission accomplished in the time between post-WWII and 911). Israel represents the beachhead established by the Western Empire (Synarchy Internationale/Rhodes RoundTable Group) as an effort of a newly-revived Roman Empire to recover its Northern African and M.E. Provinces from the earlier depredations of Muslim Empires, under cover of defending Israel using American military might, along the way to ruling the entire world as its Empire ( globalization). Go to Executive Intelligence Review (EIR). Type in their search box: Synarchy against America, and Return of the Monarchs, to see what I’m talking about. I completely agree. The Rothschilds and the Council of 300 have been in control for quite some time. worldview is being overturned. For me it’s exciting. However, when one reconsiders, it’s frightening. Congratulations on your journey into truth, Gregor. You are in good company here. Exciting is fine, but, turn that excitement into action. You will feel better about yourself. Thanks Sally. A very informative link. Sally, a good article about Dark Money. However, keep in mind, the Supreme Court was in a VERY difficult position. Allow unlimited money or allow the government to regulate free speech. Stewart confirmed he thought that such a law would be constitutional and would allow the government to ban a book published by an organization like Citizens United. There was a gasp in the courtroom. I am very divided on the decision, kill the pernicious Dark Money (good) but give the government the right to block Consortium News or Wikileaks (bad) is profoundly disturbing to me as well. The fundamental error of Citizens United is equating money with speech. Our process currently excludes third parties from the debates unless they can garner 15 percent in the polls. Without money they don’t get the exposure to get the 15 percent and are excluded. Now THAT is limiting speech. If we had a system that gave equal exposure to all candidates by making the major TV networks provide FREE time for speeches and debates in fulfillment of their public service, then we would have FREE speech, fairness, and an informed public. Equating money with speech just gives the billionaires the means to get their message out there in saturation, and exclude voices they don’t want the public to hear. It is ridiculous sophistry to equate money with speech. Then we need a statute that lays that out. Okay, Jill Stein gets to the debate. But then the media refuses to cover her because her agenda doesn’t fit theirs. Okay, we can fix that by giving each candidate a certain amount of free commercial air time. But the media refuses to cover her beyond the free air time. (Ah, free air time and national exposure, so a guy like Alex Jones sees that, with no intention of running for President, but to use the opportunity to promote his latest racial conspiracy theory and website.) Back to Jill Stein not getting any media stories: Okay, then we fix that by saying the media can’t cover politics beyond the officially allocated free air time. (so now we are at free speech again, does that include Consortium News, Wikileaks, etc?) The problem is designing a statute that does what you want it to do without generating additional unforeseen consequences down line. That is up to the legislature to do that, not the courts. But once the Solicitor General said the government could ban books, it went too far. Had it stood, Trump or the Deep State would now be deciding what the American people can and cannot see. If you believe the government has your best interests in mind, that would be fine, but a lot of people don’t have that sentiment. But to weaken the power of government is to leave the process of governing open to other organized centers of power, which would most likely, in these modern times, be corporations taking on the reponsibility to manage human society, which, btw, is literally corporate fascism. You are then left to the mercies of any manifestation of Noblesse Oblige among the corporate managers to promote and provide for the General Welfare of the people, and there are MANY people around who do not share THAT sentiment (I been trained and worked within a union, and since their destruction by Reagan’s Thatcherism, I know what it is to work without benefit of union representation; it is a worse situation).It would be naive in the extreme to believe people will be left alone to roam the plains like a herd of buffalo, unmolested by those seeking to reign them in. You see, the truth is that the actual wealth of any and all Nations, is their people, organized and trained as a labor force exercising their talents in creativity, ingenuity,productivity, literally taking rocks out of the ground and turning them into Fords and Chevys and Apollo Moon rockets and whatever else their creative imaginations devise. Oligarchs always seek to harness that power for their own ends; this is the corruption of slavery. But people also need to work cooperatively in teams to get sufficient division of labor produce great and mighty things of enormous benefit to the General Welfare. What is needed is a government controlled by the laborers themselves (We The People) to keep the managers in line and on task to organize the work process and not be tempted into forming a fascist oligarchy injurious to the General Welfare, BOTH to the laborers AND themselves, because in the long run, the laborers will not tolerate such a situation, and will make war upon the managers and their loyalists, which is of course also injurious to the General Welfare. In the end, whatever promotes the General Welfare is the highest priority. And , btw, promoting the General Welfare is just a modern secular way of re-stating Jesus’s 2nd Commandment to love one another, which basically means,not enslaving them or making war upon them, and seeking to better their conditions of life, to,render our common condition of,earning our bread by the sweat of our brow as non-onerous as possible (oligarchs seek a way around this by just selfishly enslaving a workforce to make it work for THEIR BENEFIT, to the detriment of that workforce). I would think that there would be some form of vetting process to gain access to the debates and the free air time. Most likely a petition drive to have “x” number of signatures to qualify. As for people like Alex Jones, I trust the general public enough that given real information and open debate, people like him wouldn’t get far. I understand the possibility of “unforeseen consequences” in designing legislation, but we have already seen the consequences of equating money with speech, and they are disastrous. Breaking up the media monopoly would ensure people like Jill Stein got reasonable air time. As a candidate gained popularity, their coverage would go up because they attract more viewers, thereby benefitting that media outlet. As it is now, we have the tail wagging the dog. Mandating diverse media ownership would eliminate that. Haha! correction “All animals are equal…” knew it looked wrong and had to google the actual proclamation made by the pigs….read the book in my teens…a foggy period. Unlimited free speech for individuals not persons abolish corporate personhood and abolish the legal fiction of “money as speech” that was used to strike down post Watergate campaign finance reform. We have seen what it leads to.